CRUELLA DE VIL at the California Science Center gala for the exhibit, “Dogs! A Science Tail,” was trustee Margo O’Connell, accompanied by husband Michael. Who let the dogs out?! Well, at the California Science Center’s 21st annual Discovery Ball, over 700 guests found out. They were greeted by the LAPD K–9 Unit, demonstrating what they do best with protective equipment in place, and by the LAFD with the fearless dogs of the National Disaster Search Foundation. The cocktail hour March 15 featured delicate hors d’ oeuvre that were upstaged by dog-bone shaped nibbles and, of course, Pink’s Hot Dogs washed down by Salty Dogs. No detail was overlooked; grass upholstered sofas and lounge chairs, doggie topiaries, and a large picket fence enclosing the most adorable puppies. Wallis Annenberg, president and chairwoman of the Annenberg Foundation, assisted the ribbon-cutting ceremony with Sara Carson and her “Super Collies” (canine stars of “America’s Got Talent”) for the much-anticipated exhibition “Dogs! A Science Tail.” A private viewing was available throughout the evening. As guests were being seated, the dinner scene in a green park setting below the Shuttle Endeavor was completed with “fire flies” and a forest of live (human) trees. The first course was “a secret vegetable garden” in edible soil with a dog-shaped butter toast standing at the center. 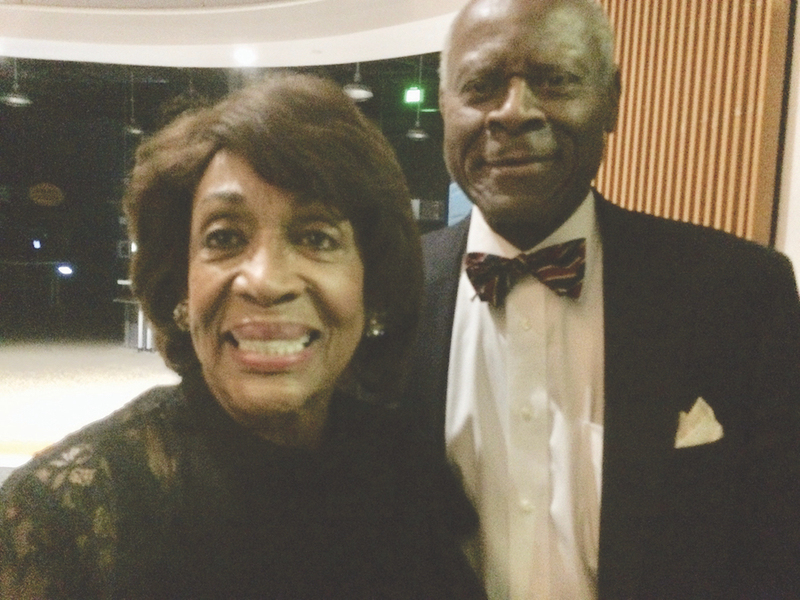 CONGRESSWOMAN Maxine Waters attended the Science Center Ball with her husband, Ambassador Sidney Williams. Science Center trustees Margo O’Connell, decked out as Cruella De Vil and Sukie Garcetti dressed as a Dalmatian. Their respective husbands Michael and Gil accompanied them. Other swellegents among them were Jon Vein with son Jack, Congresswoman Maxine Waters with husband Ambassador Sidney Williams, Patti MacJennett, Mary Carley, ball co-chairs Dan Beckerman and Jon DeSimone. Science Center president Jeffrey Rudolph entered the stage with his golden retriever, Buddy, and expressed his excitement over the debut of the center’s latest exhibition, “Dogs! A Science Tail,” which continues through Jan. 5, 2020. “The proceeds from this evening will enable us to continue providing exceptional science learning and educational opportunities,” Rudolph explained. His comments inspired attendees to bid thousands on the Center’s Science Camp scholarships. BIG SUNDAY honored Jon Vein, center. Ellen Goldsmith Vein and son Jack were also at the event. 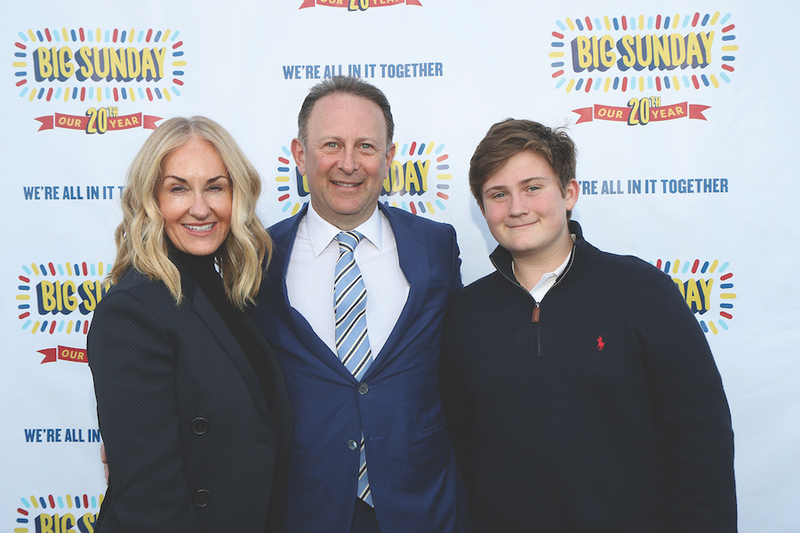 The prior evening was a momentous occasion for Jon Vein and his wife Ellen Goldsmith Vein as Jon was honored by the beloved, hands-on organization Big Sunday. David Levinson, founder of what began 20 years ago as Mitzvah Day and ballooned into the citywide charity it is today, told the crowd how grateful he is to have met and known so many kind and generous supporters. The bash was held at Candela on La Brea and also honored staff member Berenice Katcher and NBC Universal. Among the 400 enjoying dinner and dancing to the Blue Breeze Band were Susan and Howie Mandel, Dr. Henry and June Takei, Jane Gilman, Andy Goodman and Carolyn Ramsay, Corie Brown and Chris Fager, Andrea Troyer, and Jen Devore. There was lots of art-related activity last month. Former Larchmont resident, architect Scott Johnson, had a one-man art show in the Eastern Projects Gallery in Chinatown. The gallery is in the large Blossom Plaza apartment complex that Scott and his firm designed, right next to a Gold Line station. 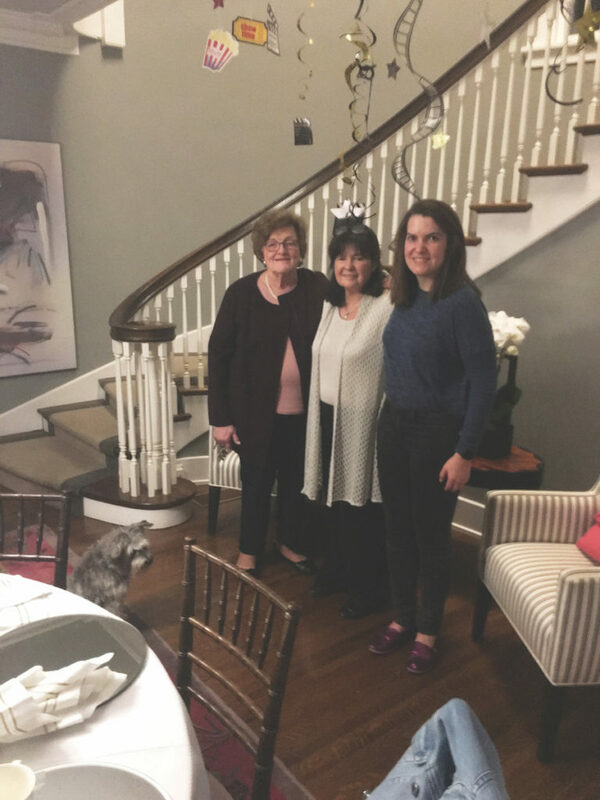 Among the many attending were both now-adult Johnson children, Zoe and Max (who lived for many years in the house Scott designed on Larchmont Blvd. that now will house the Jane Club), Jennifer and Bill Fain, Meg Jenkins, art maven Merry Norris, and UCLA architectural historian Tom Hines. The show runs to Apr. 27. 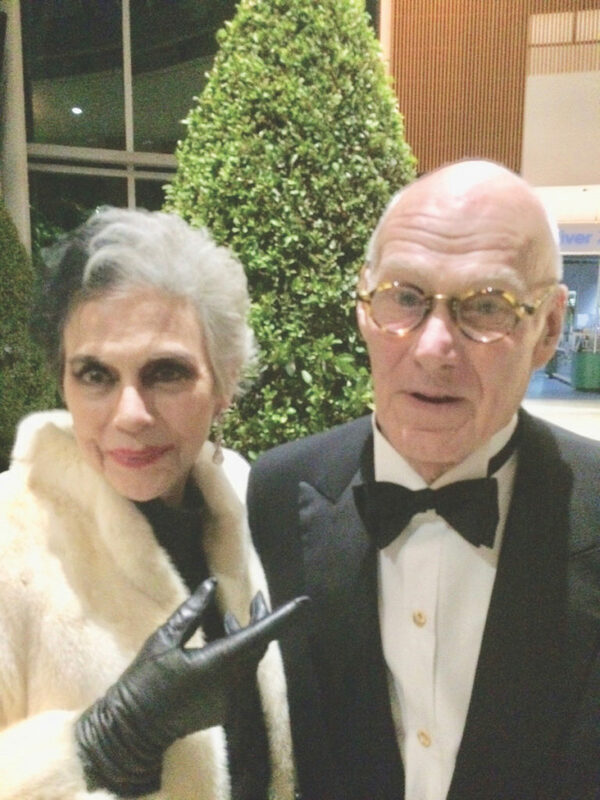 Earlier in the month, California Art Club president Peter Adams was master of ceremonies for the Collectors’ Preview of the 300-plus paintings and sculptures created by club members, including Gayle Garner Roski, who grew up on Hudson Ave.
AT THE OSCARS were Karla and Bill Ahmanson. 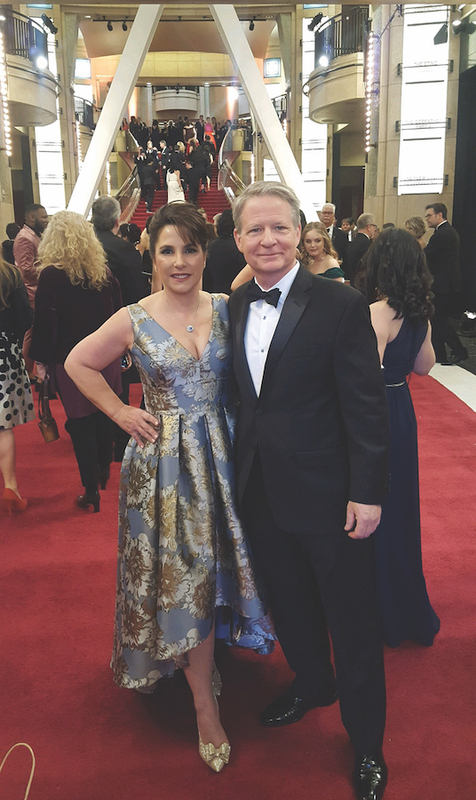 And the Oscar goes to… looking as stunning as any red-carpet couple at the Dolby Theatre on Feb. 24 were Karla and Bill Ahmanson. HOME WATCHING the Oscars at Chez Fowkes were Marge Graf and hostesses Flo and Sloane Fowkes. Meanwhile, snuggled up at home with a gathering of family and friends was Flo Fowkes at her Plymouth Boulevard home. Flo’s daughter Sloane, neighbors Marge and Alan Graf, Carole and Beryl Farfel, Betsy Phillips and Connie McCreight feasted on chicken chili, cheese and jalapeno cornbread, goat and mascarpone-stuffed dates wrapped in prosciutto, and chocolate olive oil cake with raspberries, all while playing Oscar bingo and picking winners. All agreed they ate as well as those attending the post-Oscars Governors’ Ball! Larchmont merchants also know how to celebrate. Periodic mixers for members of the Larchmont Boulevard Association have been held in many local places — Ahmet Zappa’s office, Café Gratitude, Keller Williams and more. But none has been as high as, and with as good a view as, the mixer held at Larchmont Pediatrics’ offices on both the north and south sides of the top (tenth) floor of the Larchmont Medical Building. Hostesses Drs. Neville Anderson, Alexandra McCollum and Amaka Priest welcomed LBA members with plentiful provisions from Larchmont Village Wine and Cheese. Among the local businesspeople seen were Bob Day, Vivian Gueler, Leisha Willis, Mel Miyamoto, Liz Fuller, Dr. Jim Gibbons and Kathy Whooley. AUCTIONEERS for NGA’s “Caddyshack for a Cause,” Olivia and Steve Kazanjian. 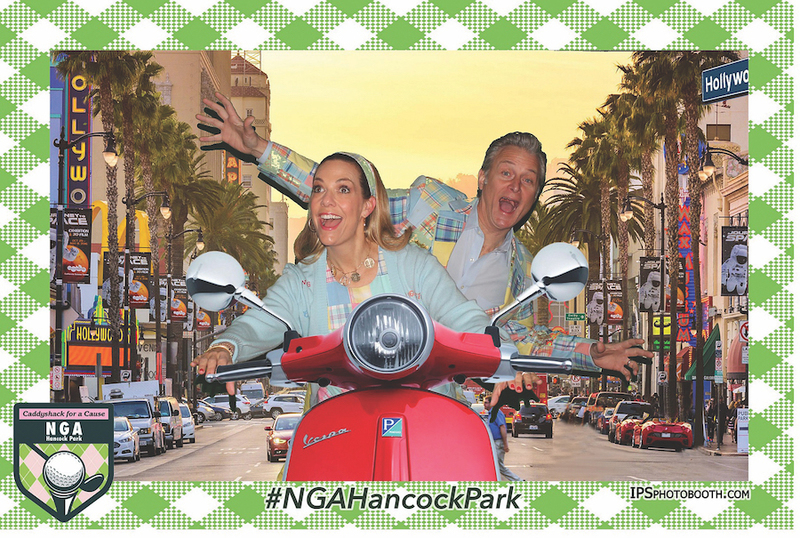 The numbers are in from NGA’s “Caddyshack for a Cause” held at the Wilshire Country Club Feb. 23. The event attended by over 200 guests raised a record $100,000 for the purchase of new clothes, linens and all that is needed by area charities. Kudos to co-chairs Kiel FitzGerald and Megan Derry as well as Kathleen Macomber and auctioneers extraordinaire Olivia and Steve Kazanjian. 4/4/19 –– This article was updated to correct the honoree of the Big Sunday event and Ellen Goldsmith Vein’s name.